Coming President's Day Weekend 2018!! The 46th Las Vegas Jeep Club Sand Drags & Hill Climbs will be held at the Dumont Dunes, CA. Saturday (Feb 17) will be the Hill Climb event with Sunday (Feb 18) the 300' Sand Drags. Click on over to the LVJC Page on NSDN for class info & more. Stay tuned for more info on this event as it gets closer. Mark your calendars now to be in Dumont on President's Day Weekend!! Click "Read More" to view full flyer. Congratulations to all of the 2017 Southern California Sand Drag Association class champions! These racers fought tooth and nail for each round win en route to their respective titles. The SCSDA will be handing out trophies & gold cards at the Season Opener February 23-25. The Southern California Sand Drag Association has announced their 2018 Race Schedule. SCSDA’s 2018 season kicks off February 23-25 followed up by Race 2 one month later March 23-25. Then, the SCSDA Season Finale will take place on September 28-30. All three events will again be held at the Soboba Casino in San Jacinto, CA. Look for more announcements regarding the SCSDA 2018 season posted as the season gets closer. 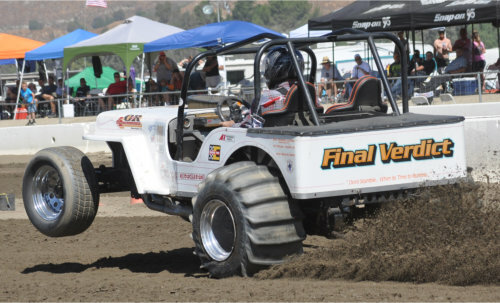 Be sure to like the So Cal Sand Drag Association on Facebook for all things SCSDA as well as www.SoCalSandDrags.com. The Avenal Sand Drags crew once again raised the bar with a tremendous Fall Nationals event to wrap up the 2017 sand drag racing season on the west coast. A record racer turnout for Avenal Sand Drags led to full fields in most categories. This put on a great show for the Central California crowd. Let’s recap all the great on track action throughout the weekend. Prime racing conditions led to an incredible final day of racing at the 2017 Avenal Sand Drags Fall Nationals in Avenal, CA. Jake Morton put down a strong 2.51 ET to earn the Top Alcohol class final round victory over Jim Hammond. Jim Rossi persevered through bad luck early in the weekend to put his “Bad Toy” Dragster in the Winners Circle with the TE class win. A similar story could be told for Robert Watanabe and the Watanabe Racing Dragster as he fought through some gremlins to take the Pro 1 class win over an incredibly tough field. Justin Adamson was on his game all day Sunday and took home top honors in the Pro 2 category defeating Charlie Johnson in the final. Speaking of on their game, Charlie Johnson made it to his second final round of the day & earned the Pro 3 victory defeating Stacy Bolton. A great story took place in the Motorcycle Pro categories as brothers Taylor Holmes & Dylan Holmes swept the MP1-MP2 categories. Taylor’s MP1 win and Dylan’s MP2 win coupled with Cole Foy’s MP1 meant Team Marchant swept 3 of the Top 4 spots in MP class competition on Sunday. Junior class competition was great as always with a field of 40+ entries taking to the track Sunday morning. Chaylene Pintor broke through for her first final round win in the Junior Dragster class after many final round appearances in the past with her very cool Junior Truck. Tessa Nunes used consistent low 5-second ET’s to earn the Juniors class victory. Last but not least young Jhett Montgomery stole the show in his first ever race day as he blistered the track with 4.5MPH laps en route to the Youth class victory, which was such a neat moment for the next racer from the Montgomery Family. Run Sheets & TA/TE Highlight Videos are now posted. The 2017 SCSDA Hammer Down Nationals was once again a huge success at the Soboba Casino in San Jacinto, CA. Sunny skies and warm temps during the day with nice cool evening air made for some incredible racing action across all three days. The Saturday Night Thunder show once put on a phenomenal show with Heads-Up Qualifying under the lights in front of a huge Southern California crowd. Big money was on the line for Sunday Race Day with added purse money on the line. Continue on to read about the Winners as well as check out our Event Photo Gallery.